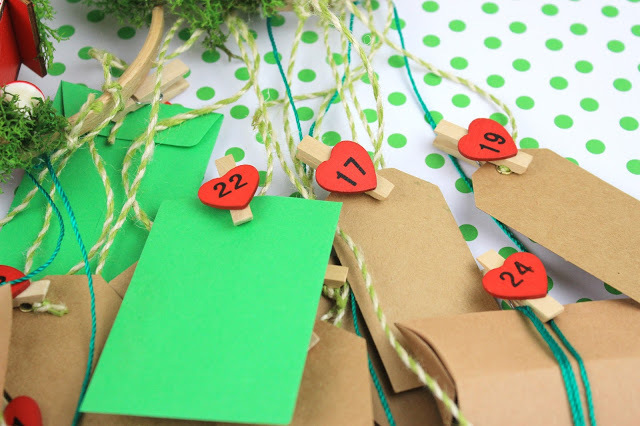 Diy Christmas Woodland Advent Calendar and let;s start counting together!!! I am really proud , it is the first time I am on time for our Advent Calendar! Oh yes… every year I had it on my mind to create something for the kids and everytime I was cancelling because of no free time at all! Last year it was my first official attempt to create an Advent Calendar for the kids, a really simple craft full of color! The kids were thrilled and and also I did, because it was a challenge for me to find activities for the kids and at the same time the best way to organize myself and our program! This year I have decided from the first of November that we will have a proper Advent Calendar this year… and then we had this small amazing excursion in Agoriani and the idea just came in my head…Woodland my friends, with gnomes and elfs and houses and… so let’s create it together! 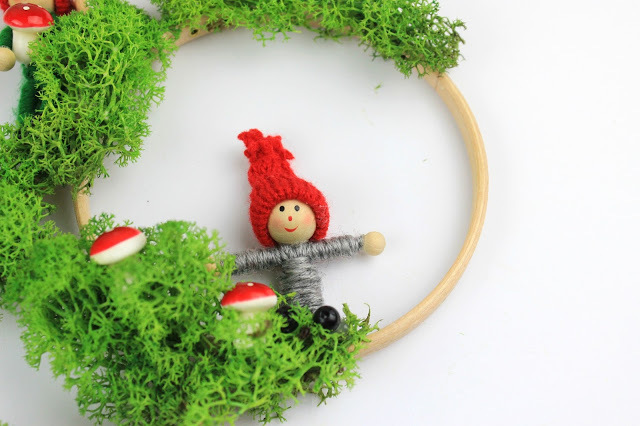 I think you know me… lately I have a passion about everything woodland and this actually started when I first got in my hands the colored moss from airplants, that we have used for our Autumn Woodland Wreaths in Xeirotehnika Craft Party! 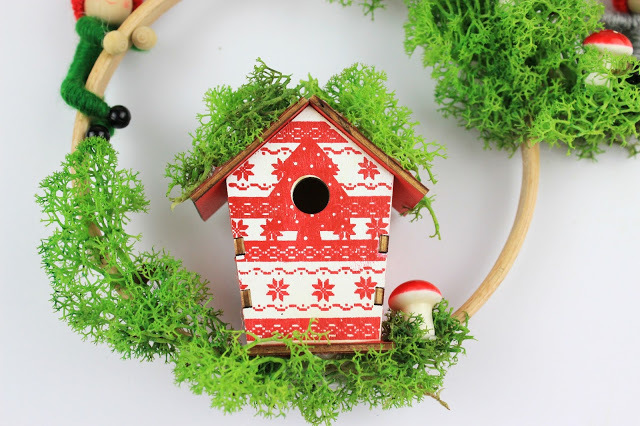 So it was not possible to have an advent calendar without something from the nature or without an embroidery hoop. Also I have to admit, that I am in love with these little gnomes from Tiger Stores! Actually I have decided to create something to have it on our fireplace even if Christmas have ended! But let’s start! 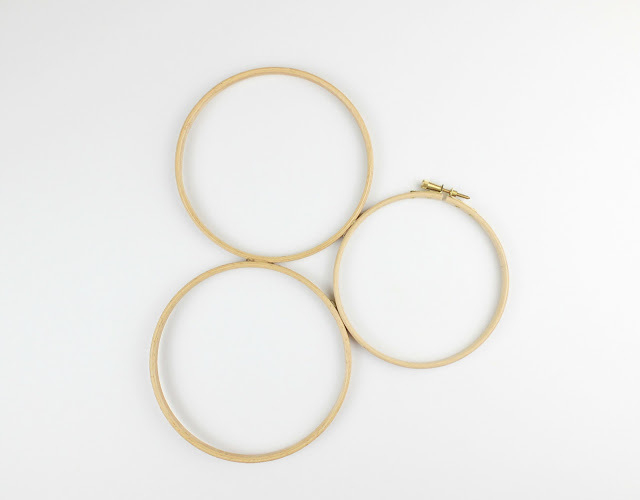 We will need 1 and a half embroidery hoop or of course even more. Decide how would you like to compine them and add hot glue in the common edges. In order to make it more stable, just use rope to cover the parts with the hot glue. No worries, even if they do not look pretty, we will cover them with moss and we will hide them. And now let’s start with the funny part…the decoration. Just close your eyes and imagine you are in a forest full of moss and mushrooms and woods and colors! 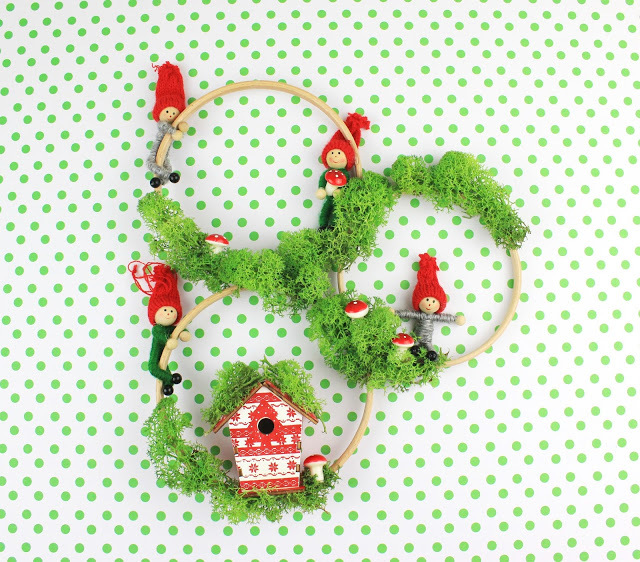 suddenly you discover a tree, with gnomes on its branches! The gnomes are having fun and they laugh and play! 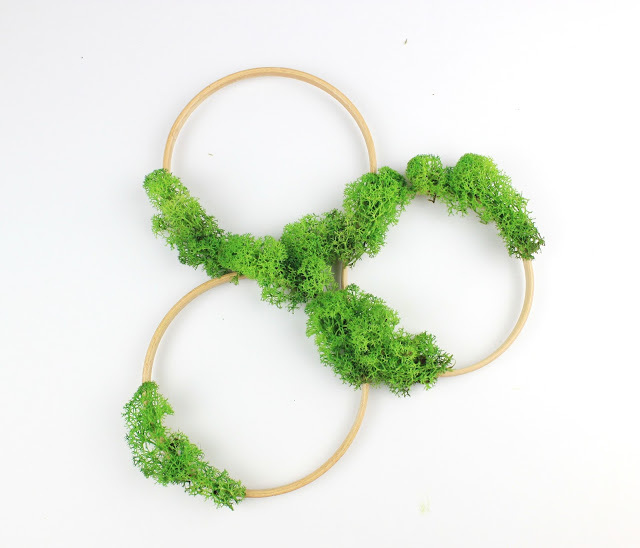 Ok, you got it…noe open your eyes and start decorating your hoops with moss and hot glue! 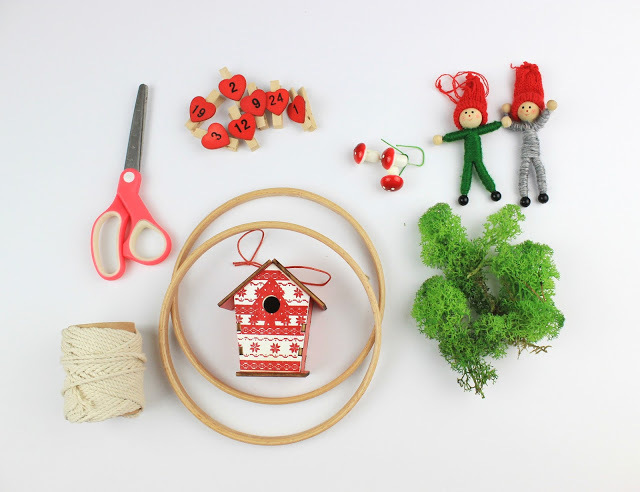 Cover the parts with the rope with moss and then start adding the tiny mushrooms and the little gnome house. Last but not least, add your little gnomes! And our Fairyland is ready! And guess what I did wrong and created a tiny problem that eventually it was solved with hot glue again… yes, you are correct… there is not much free space on the hoops to add your gifts and your boxes and everything that need to be hang. 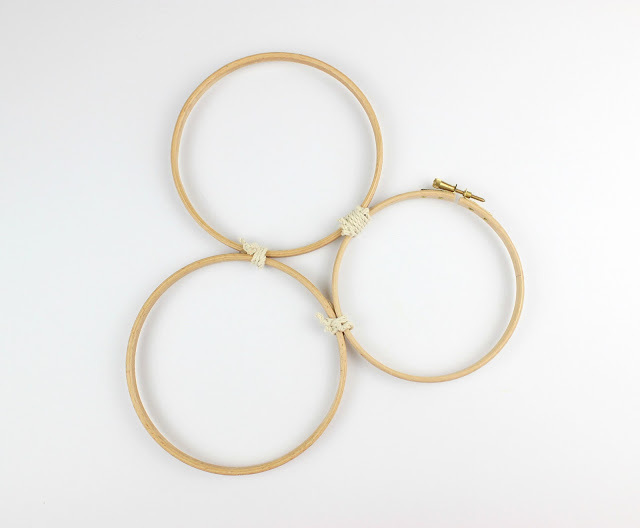 No worries again… just put some hot glue on the back or the hoops and glue the rope. Clothpins on the robe and we are ready! And now the next problem… the weight! 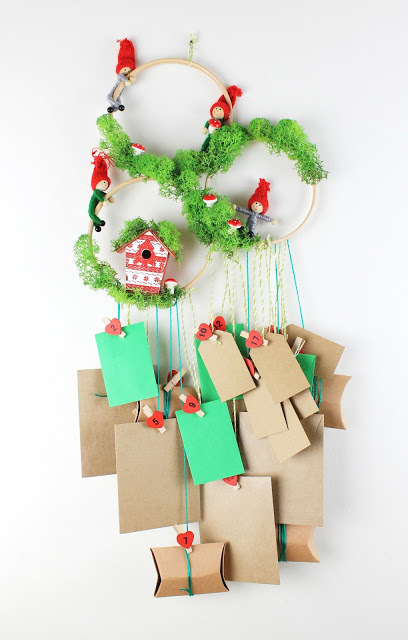 Indeed, due to the hanging gifts , the center of gravity is changed and the wreath might be a little bit diagonal. Again this problem can be solved with double rope when you hang it on the wall and of course this will permanately solved when you are done with the gifts. Just remove them from the wreaths! 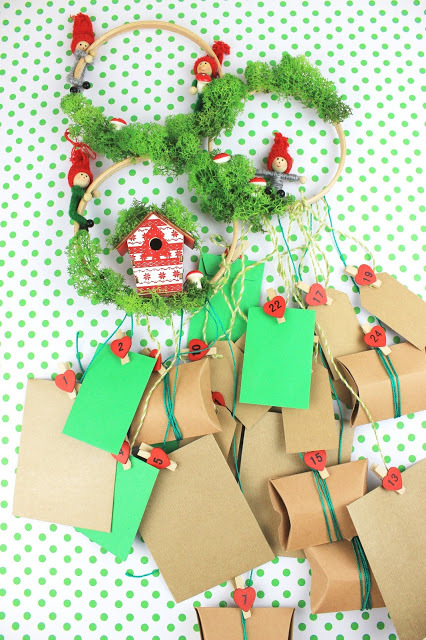 I kept the envelopes and labes and boxes in their natural color, without adding anything else, because I belive that in this way the eyes are on the gnomes land and not on the gifts…of course I am not the kid here… or maybe I am! What is hidden on the hanging part? Easy! Theater for the kids, Christmas Cinema Night at home, Cooking with mom, creation of handmade gifts for our teachers and friends, walks on the mountain, tiny gifts, handmade ornaments and creations, letter to Santa Claus, handmade Christmas wishing cards and of course our customized soupla! Well, actually this is the best way to have time with your kids, to feel the Christmas spirit and to feel like kid again!!!! 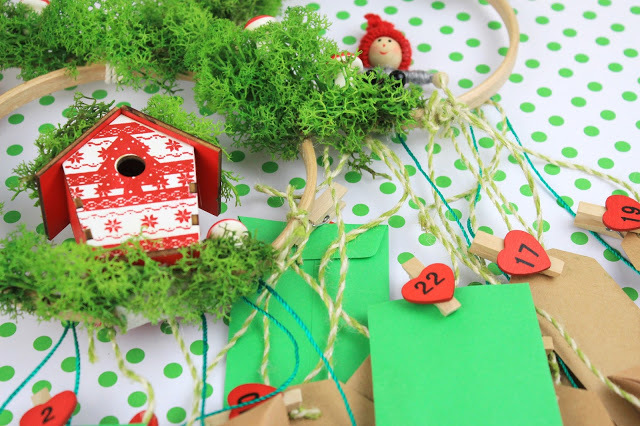 So…have you done an Advent Calendar for this year??? Έχω εντυπωσιαστεί για τον συνδυασμό υλικών που έχεις κάνει!!!! Συγχαρητήρια!!! φανταστικο και μαγικο!! μπραβο Ζηνα μου!! Υπέροχο Ζήνα και εγώ θα ήθελα ένα τέτοιο!! !Το κακό με τον Φραγκισκάκο είναι ότι ενθουσιάστηκε τις 2 πρώτες φορές , αλλά την τρίτη δεν του έδωσε και πολύ σημασία,οπότε το εγκατέλειψα και εγώ!Μάλιστα μία χρονιά έφτιαξα και για την αδερφή μου και για τον σύζυγο μου!Καλημέρα!!! και ποιός είπε ότι το ημερολόγιο είναι μόνο για τα παιδια;;; Υπεροχη η ιδεα σου για το ημερολογίο στα αγαπημένα πρόσωμα…θα στην κλέψω! Φανταστικό! Έχω ξετρελαθεί. Ο καθαρός αέρας σου πάει πολύ Ζηνάκι (όχι ότι διαφορετικά σου λείπει η φαντασία φυσικά)! Και του χρόνου να είσαι καλά! Αχ αυτά τα τελαράκια!! για όλα κάνουν και παντού ταιριάζουν!!! Εντάξει!!! Είμαι απλά ερωτευμένη με το φετινό σου καλεντάρι. Πολύ ομορφο!!! Με εκανες και κοκκίνησα! χιλια ευχαριστω Σωτηρία μου! Ναι ναι! το λατρεψαμε όλοι μας και γι αυτό και παραμένει! Μου αρέσει πάρα πολύ και πίστεψε με δε θα καταλάβαινα οτι γέρνει γιατί μοιάζει πολύ παιχνιδιάρικο, λες και κάνουν κούνια τα ξωτικά πάνω στα τελάρα και είναι έτοιμα για σκανταλιά!! χαχαχα από φαντασία πάμε καλά!! 😉 Είναι πανέμορφο! !